Dividers with preprinted tabs organize documents quickly and easily. 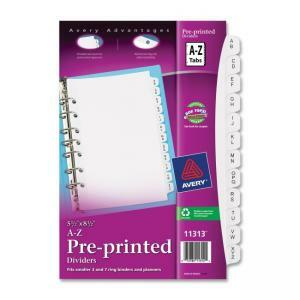 12 preprinted tabs are labeled A to Z for quick referencing. Seven-hole punched edges make the dividers ready for insertion into smaller three-ring and seven-ring binders. One side features reinforced edges for added durability and frequent use.